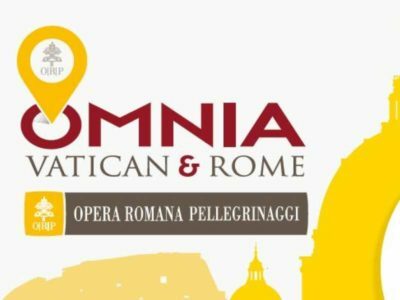 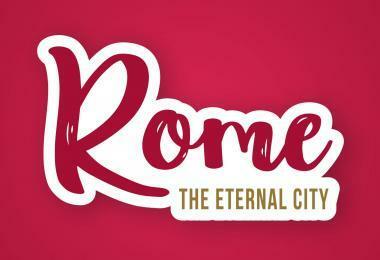 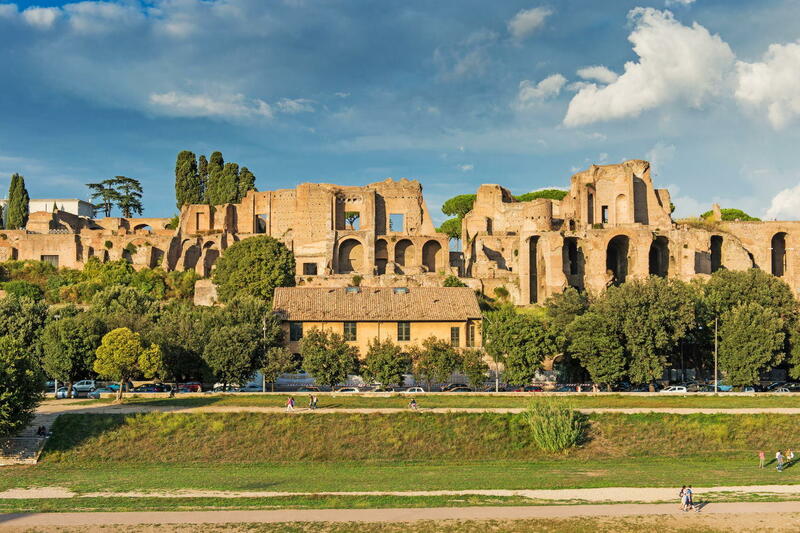 Erected in the valley between the Palatine and Aventine hills, the Circus Maximus (Circo Massimo in Italian) was 600 metres long and up to 200 wide, with a spine that must have measured 340 metres. 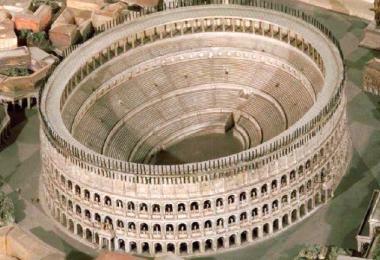 This makes it the biggest building for public spectacles of all time. 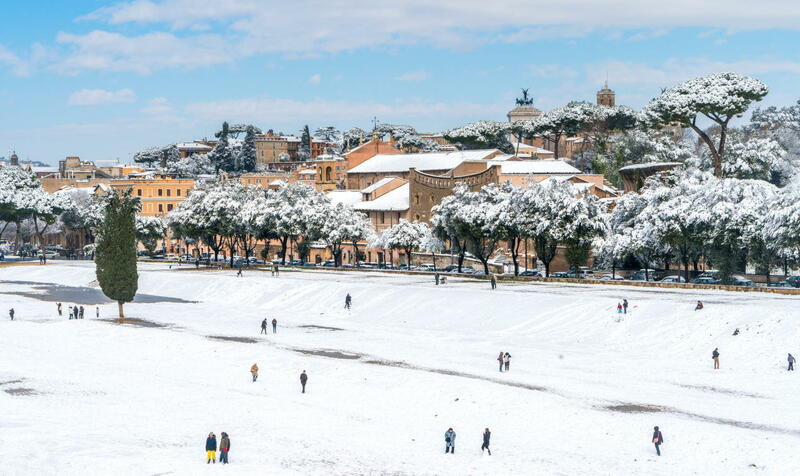 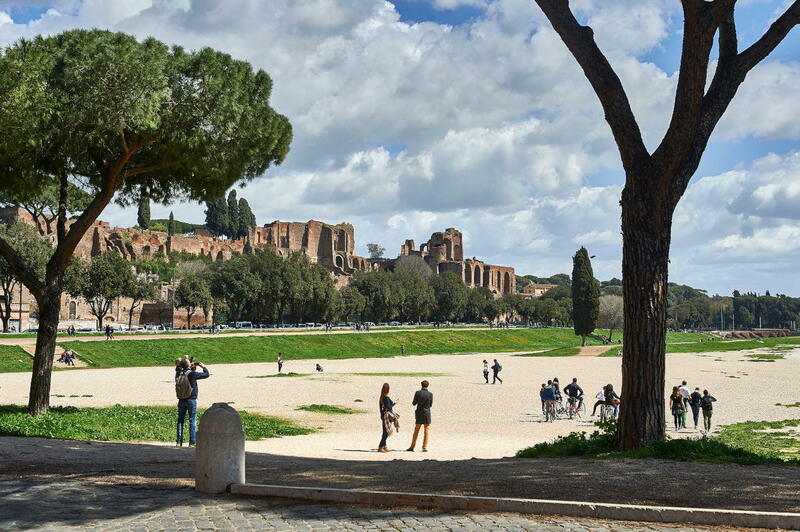 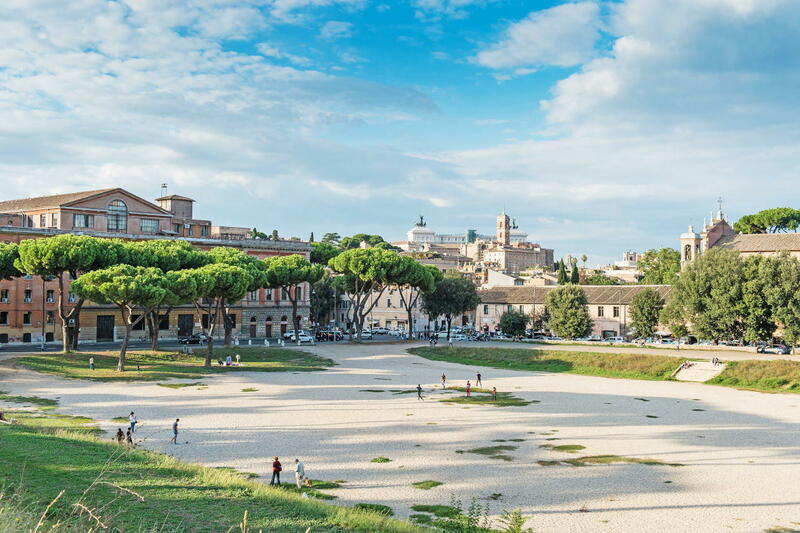 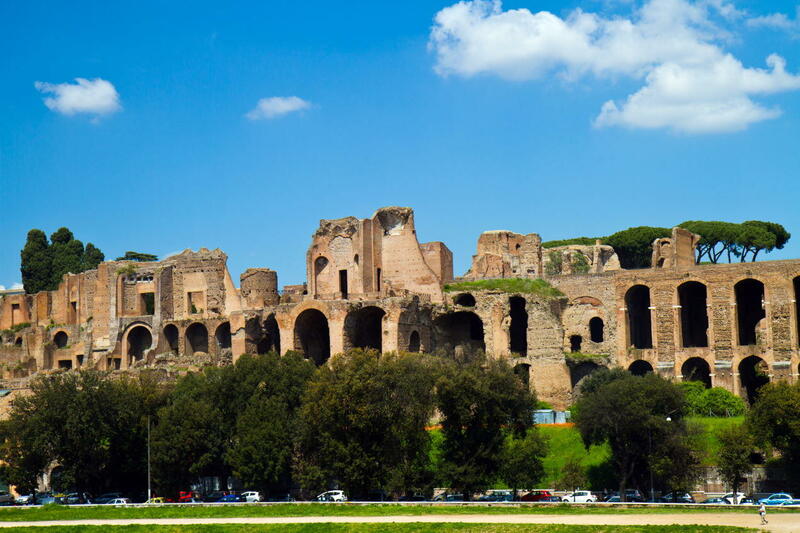 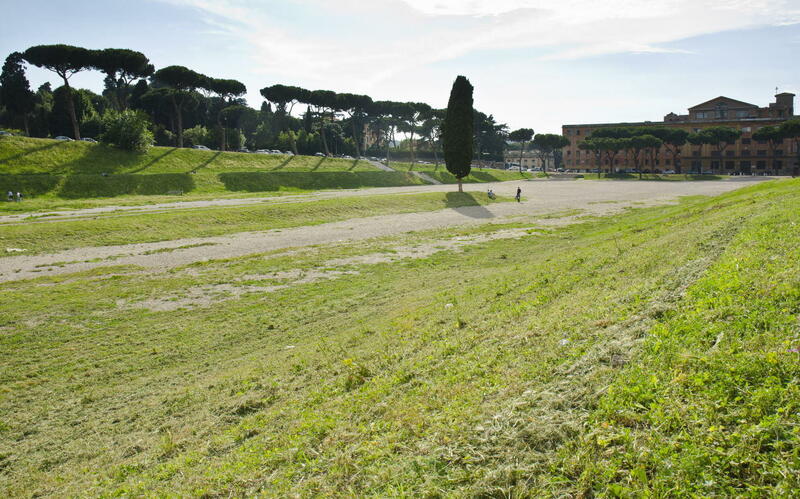 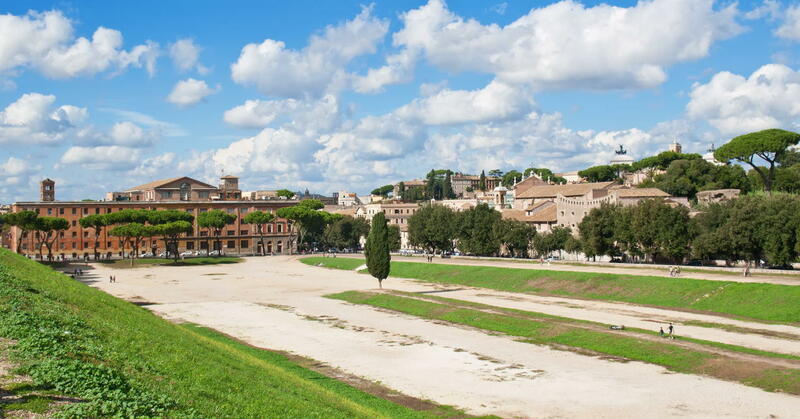 Original form of the Circus Maximus is still recognizable today, the huge tuff and travertine remains from the time of Julius Caesar surviving. 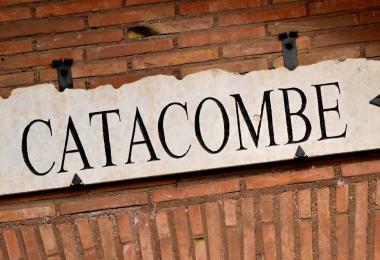 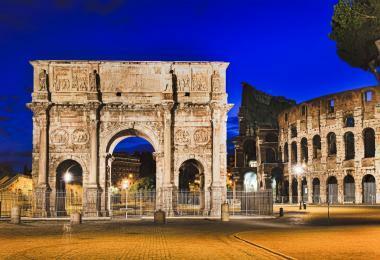 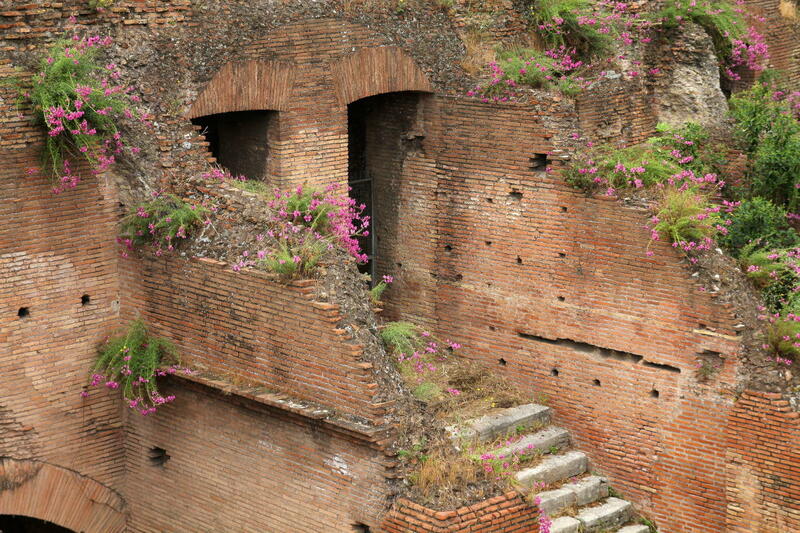 It was surrounded by steps carried on several rows of arches which could seat over 200,000 people. 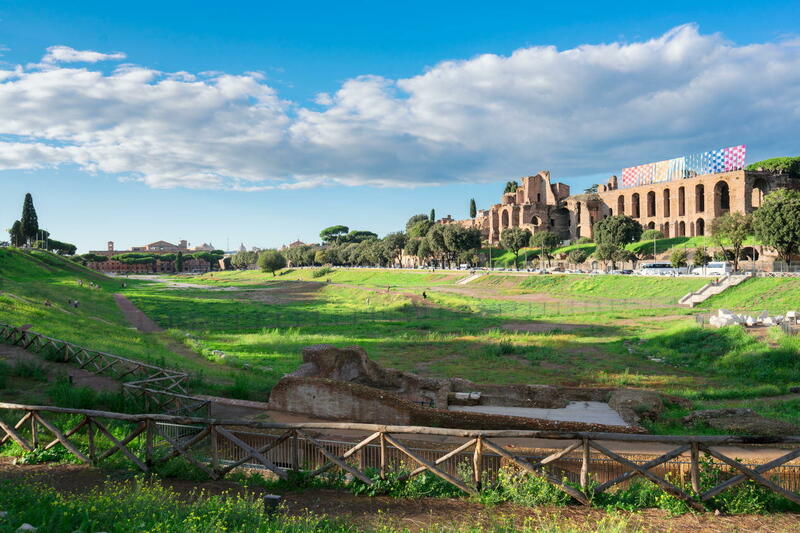 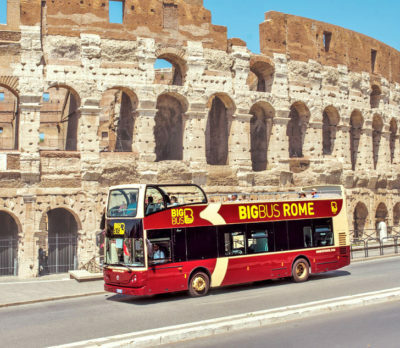 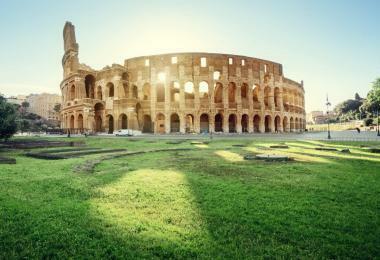 According to tradition, the first wooden stadium used for races, set in the valley between the Palatine and Aventine, was built by Tarquinius Priscus. 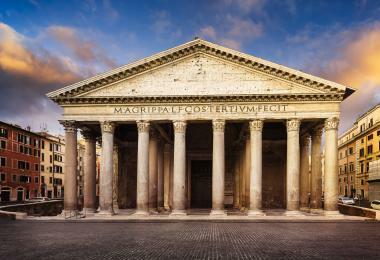 Without doubt, however, the present building is the result of centuries of extensions and rebuilding. 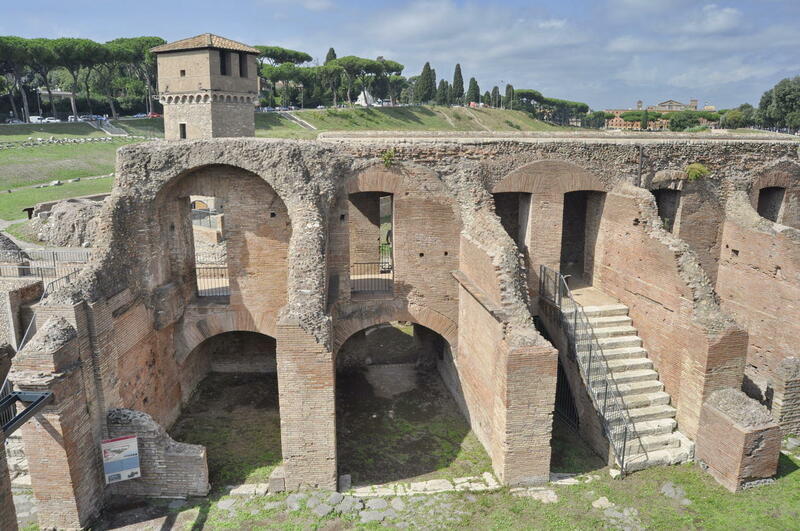 First the timber structures were repla-ced by stone steps, then in the late 4th century BC the carceres, the starting bays for the horses, were built at the short north end. Model of Ancient Rome Circus Maximus, Domus Augustana and the Palatine. Reconstruction Sketch of Circus Maximus – Photo Credit & Sketch. 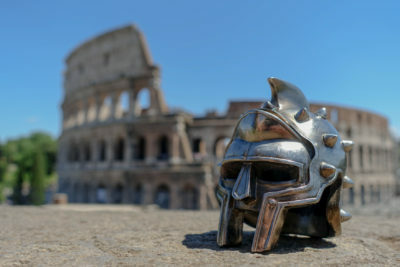 J.C GOLVIN. 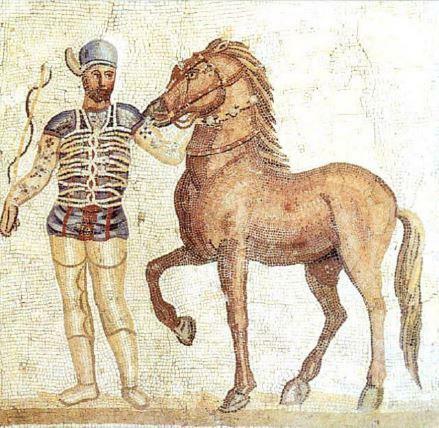 One of the occasional fancies of Imperial extravagance was to carpet the floor of the arena with precious powders — red lead, mica or malachite. 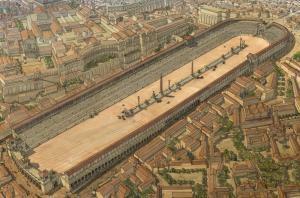 In 174 BC the seven “eggs” were placed on the spine to mark to number of circuits of the course. In 33 BC Agrippa added seven bronze dolphins. 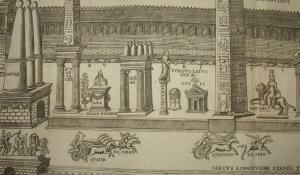 Augustus’s principal addition was the obelisk of the Pharoah Ramses II (thirteenth century BC), brought from Heliopolis and erected on the spine. 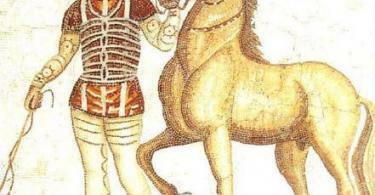 Much later, in 357 AD, Constantius II added a second obelisk, that of Thothmes III (fifteenth century BC) from Thebes. 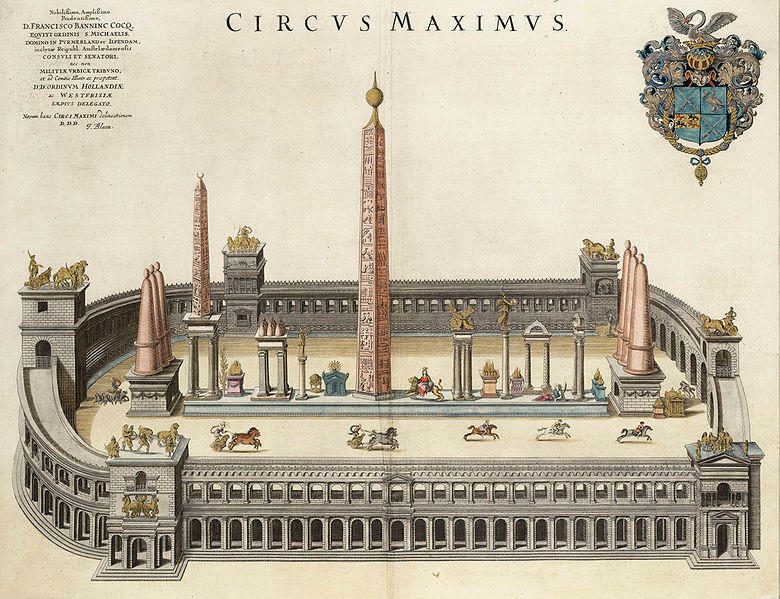 In 1587 both of the shattered obelisks were unearthed by Pope Sixtus V. The first was later placed in Piazza del Popolo and the second in Piazza di San Giovanni in Laterano. Drawing of Circus Maximus, Rome,1582. The circus remained in use throughout late antiquity. 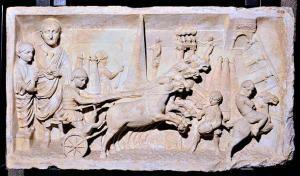 At the end of the imperial age there were sixty racing days, each of which had, since Nero’s time, lasted until sundown. 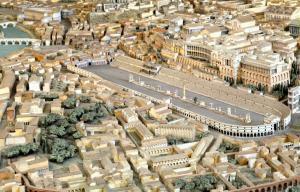 The last races were held there in 549 AD by Totila (reigned 541-552) , king of the Ostrogoths. 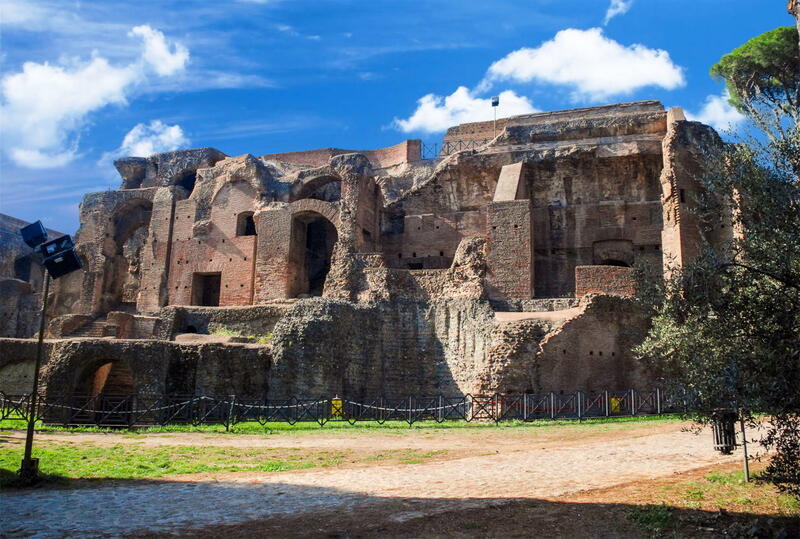 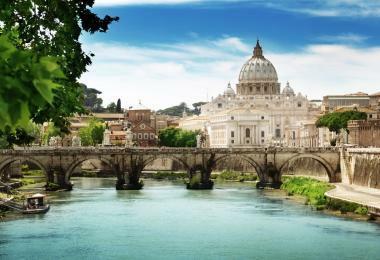 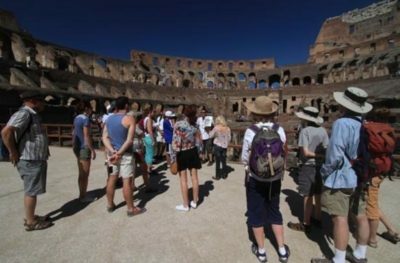 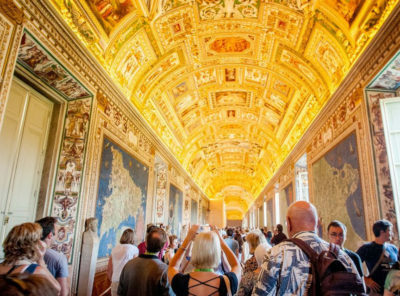 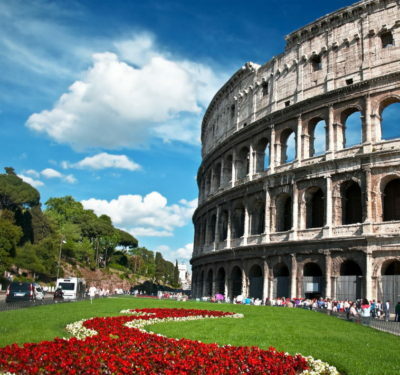 After this, largely because of the dereliction of Rome in the early Middle Ages, it gradually began to be covered in soil, which today conceals most of the building. 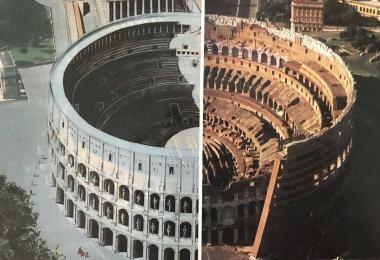 The race-track in the circus was divided down the middle by a masonry spine with a pillar (meta) at each end to mark the turns. 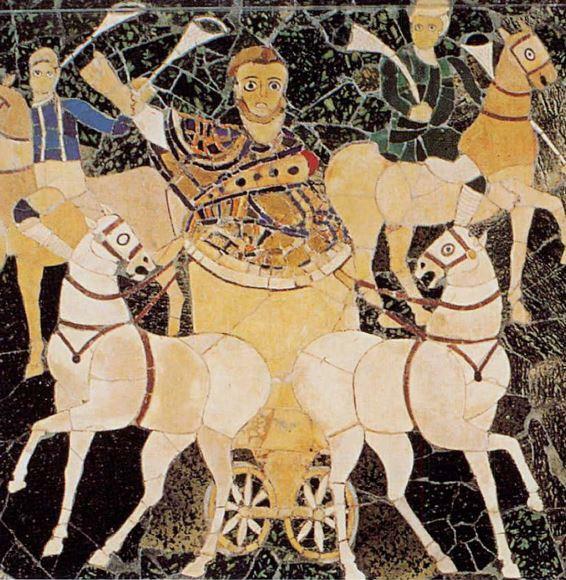 The chariots, drawn by two or four horses, were extremely light and it took great skill on the part of the charioteers to keep them from overturning (though disastrous falls were one of the attractions for spectators). 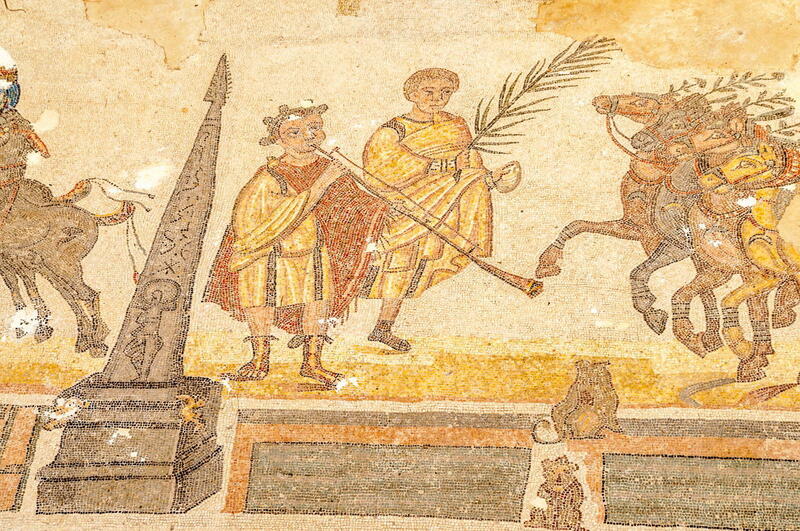 Two-horse chariot in the circus, Museo Nazionale Romano, Palazzo Massimo, Rome. 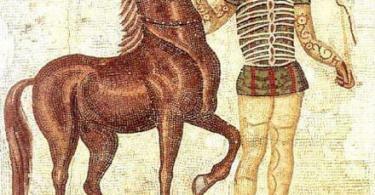 The skill of the charioteer lay in taking the turns as close as possible so as to gain ground. 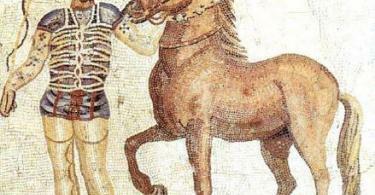 The rules allowed all sorts of foul play to obstruct opponents and send them crashing into the walls. 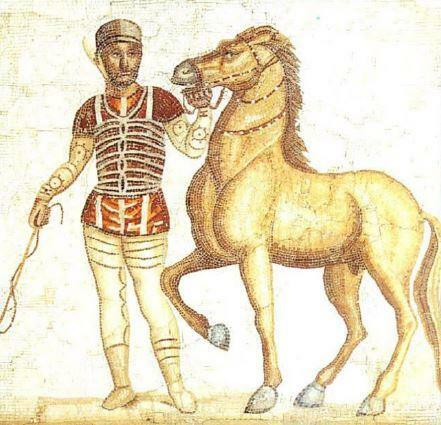 Horses and chariots were divided into teams, distinguished by different colours, and each had its supporters: the various colours eventually formed factions and had a notable influence on political life. 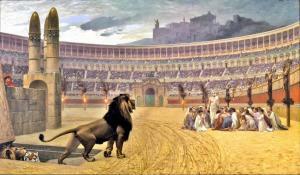 “The Christian Martyrs’ Last Prayer” by Jean-Léon Gérôme, 1883. 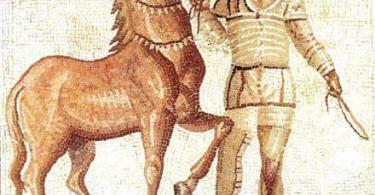 The charioteers were idolised and if particularly skilful would accumulate immense fortunes. 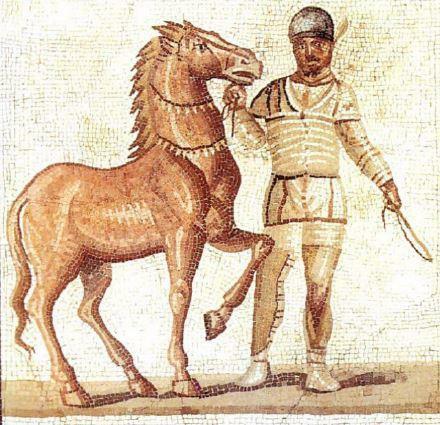 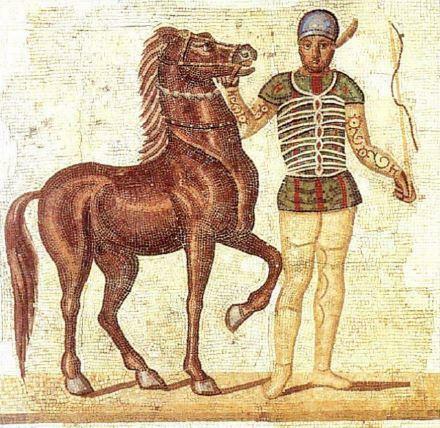 One Diodes, of Portuguese origin, raced for the Reds for twenty-four years in the second century AD: he won 3000 times with a two-horse chariot and 1462 times with a four-horse team. 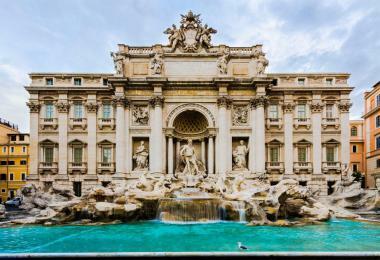 When he retired he had accumulated the fabulous sum of 35 million sesterces. 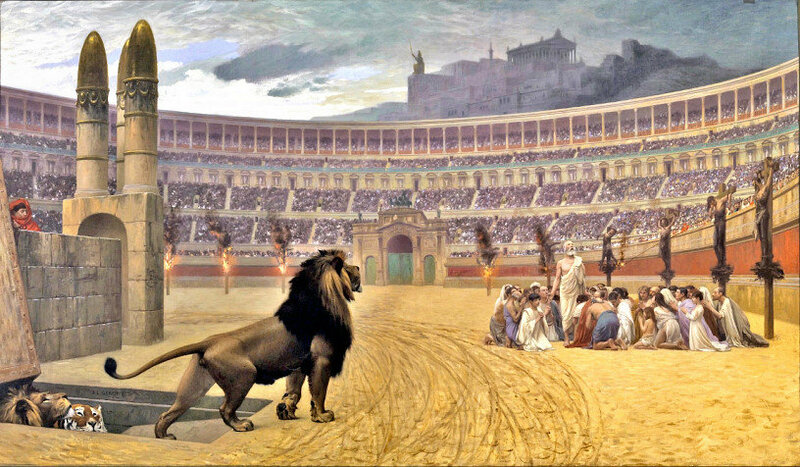 Around the circuses, like football stadiums today, there stood myriads of taverns, kiosks, and booths, and while the spectators on the terraces watched up to a hundred races a day, thieves, prostitutes, peddlers and hucksters of all sorts mixed with the crowd. 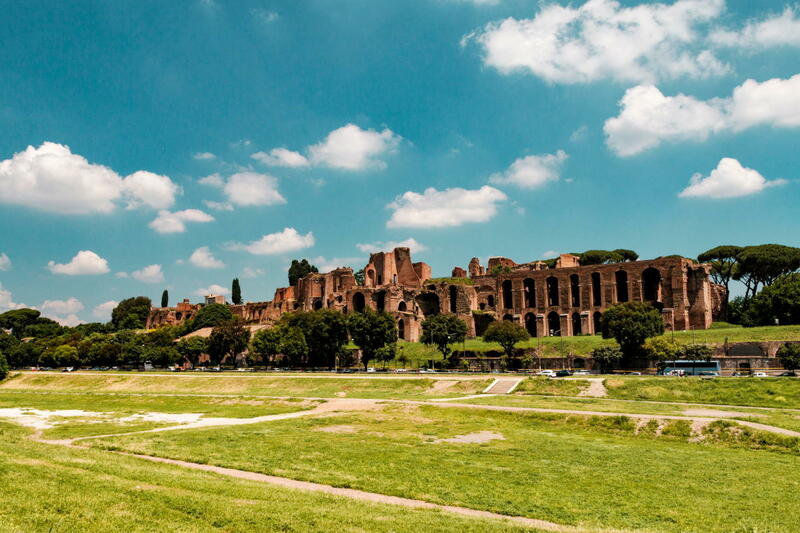 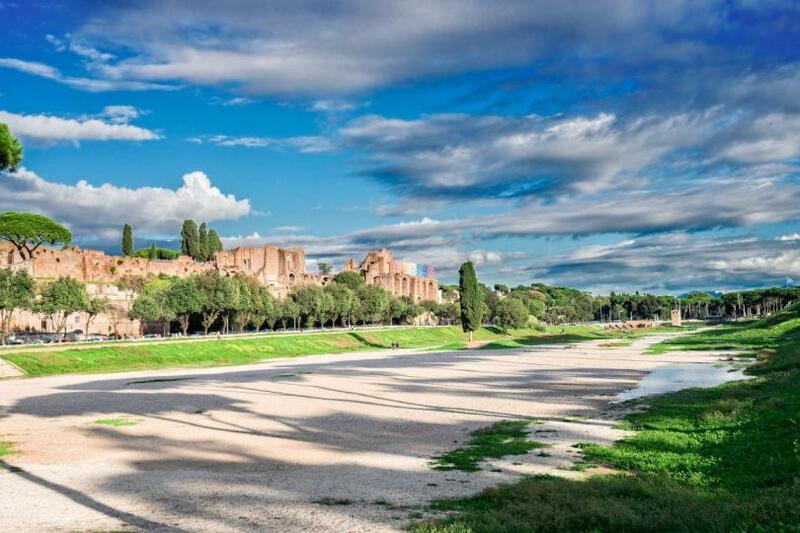 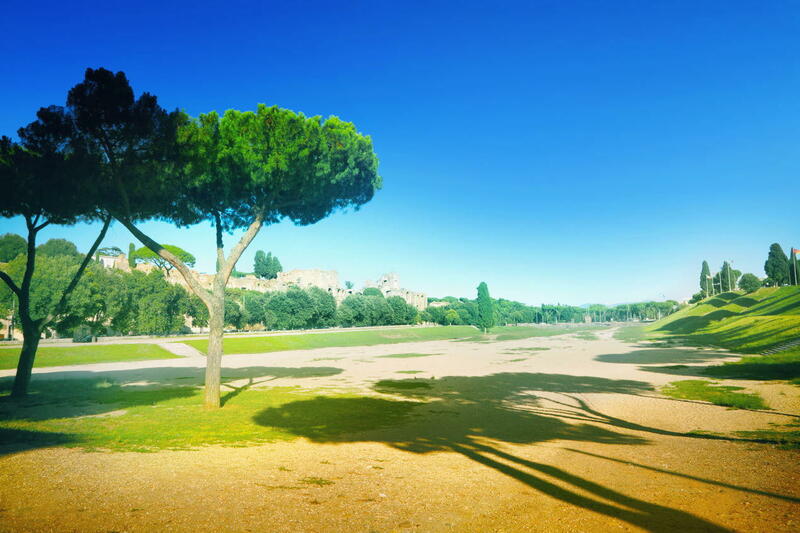 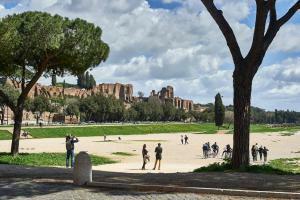 Circus Maximus set in the center of Roman Forum, 0,7 km from (9 min walk) from Colosseum.